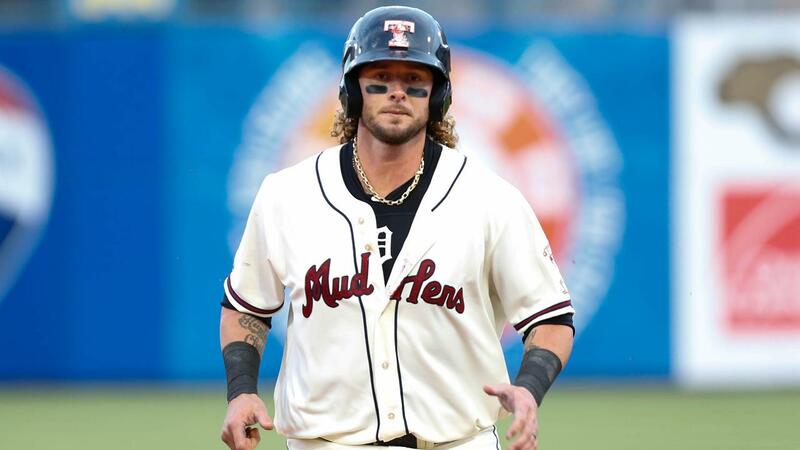 ALLENTOWN, Pa. - Seven straight hits in the first inning powered the Toledo Mud Hens over the Lehigh Valley IronPigs 8-7 on Saturday at Coca-Cola Park. Six straight one out singles gave the Mud Hens (35-19) a quick four run lead with Jarrod Saltalamacchia at the plate and two runners on. The veteran catcher proceeded to blast his first homer of the season to push the lead to seven. Tyler Alexander ran out for his Triple A debut with a large cushion to work with. He struggled early, giving up five runs in his first two innings, but was able to settle in to allow only one more run through five total innings of work. The southpaw left the game with a one run lead. That held up, as Alexander got the win. After the first inning of explosive offense, the Mud Hens were neutralized by IronPigs LHP Brandon Leibrandt, they were held hitless over the next 2.2 innings. Once he came out of the game after the third inning, Mike Gerber hit a double to put Toledo back in the hit column, though nothing else came of it. The IronPigs (29-25) were threatening to score in the fifth inning with the bases loaded and nobody out. Nick Rickles hit a fly ball out to right field where Jim Adduci made a fantastic sliding catch. Trevor Plouffe, the runner on second, thought the ball was dropping so he ran to third. That left two runners standing on third when the ball was caught, and Adduci was able to double off Plouffe at second base. It was not until the ninth inning that the Mud Hens scored again. Saltalamacchia drew a walk, then scored from first when Dawel Lugo ripped a two out double. There was a chance for more insurance after Christin Stewart walked, giving Mikie Mahtook a situation with runners on first and second. He grounded out, sending the game to the bottom of the ninth. Phillippe Aumont was charged with closing things down in the ninth after pitching a scoreless eighth inning. The leadoff batter, Dean Anna, grounded out. Things got interesting after Aumont hit Collin Cowgill and walked Danny Ortiz, bringing the winning run to the plate. A strikeout of Joey Meneses brought Plouffe to the plate, who singled up the middle. Clinging to only a run, Aumont had a runner at first and third with Damek Tomscha at the plate. Tomscha had two hits on the day. However, this time around he grounded out to second base, and Aumont collected his third save of the season. The Mud Hens will conclude matters in Pennsylvania on Sunday against Lehigh Valley with a chance to sweep the series. First pitch from Coca-Cola Park is scheduled for 1:35 p.m.
• Stewart has reached base safely in 23 consecutive road games, which stands as the IL's longest active streak. • Toledo and Lehigh Valley share the lead of team homeruns with 56 each. • The Mud Hens are 26-7 when scoring the game's first run. • Toledo is 33-1 when ahead after seven innings, and a perfect 32-0 when leading after eight innings. • With the most recent win, the Mud Hens are 16 games over .500, their best mark of the season.